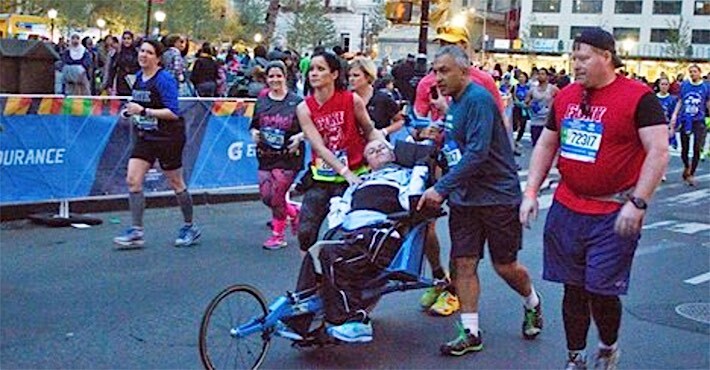 Brent Pease was pushing his brother Kyle along the New York City Marathon route on Saturday when a screech stopped them both in their tracks. “We had come this far, we weren’t going to give up,” Brent told WNYW News. He tried carrying his brother, at first, but soon realized he wouldn’t be able to cover even a fraction of the distance to the finish line 13 miles away. The duo had another idea: tie some rope to the wheelchair—maybe Brent could hoist it up and act as a human wheel the rest of the way. When it became clear the weight was too much for Brent alone, other runners stepped in to save the day. A woman from Maryland took one side, a man from New York took the other, and together, they all made crossed the finish line. Through their marathon participation, the brothers from Atlanta raise money for their charity, the Kyle Pease foundation.